I have a little problem. I can't say no...to shopping, to wine, and to supporting a new cause. My friend Julia who is our executive director of Ormond Mainstreet invited my friend Judy and I to a new cause to champion...the invite was adorable and the concept was really interesting! Dining for Women is a dinner giving circle. 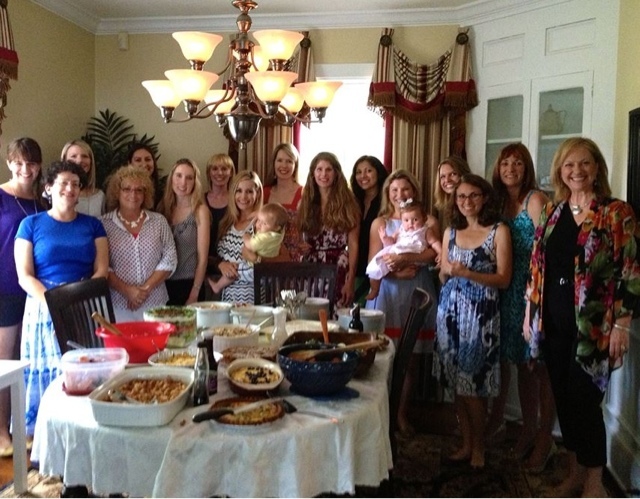 The chapter members "dine in" together as a chapter once a month, each bringing a dish to share, and their "dining out" dollars (what we would have spent if we had eaten at a restaurant) are sent to programs empowering women worldwide. Dining For Women then combine all donations from hundreds of our chapters to support carefully selected international programs each month. They fund grass-roots programs in education, healthcare, vocational training, micro-credit loans and economic development. These programs are aimed to improve the living situations for women and their families, by providing the tools they need to make changes. I was excited to meet some new people, and to connect in a different way. The funny thing, half of our Junior League showed up including my friends Erum and Kelly! Which was great, it was nice to catch up with them. I'm looking forward to something completely different for a really cool cause! Want to join our chapter? Contact Rachel or look for a chapter in your area!